Greenwich Council are to sell Woolwich’s indoor market as part of a wider plan to redevelop the area around Spray Street. 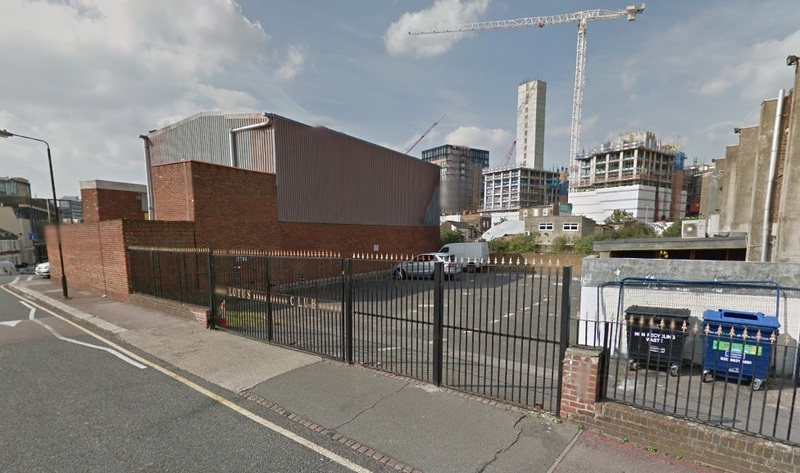 Housing Association Notting Hill Housing Group and developer St Modwen have been appointed as preferred bidders of the market and ‘Spray Street Quarter’ site, with Barratt Homes and Wilson Bowden named as reserve developers. The consultation into the entire redevelopment can be seen here. It’s a hefty 80mb but well worth a read to see the wider plans. Comments can be made until 19th December through the link. Having had a read through I find very little to disagree with. Many of the existing buildings have little merit and are in a poor state. Most are only one or two storeys tall, which is an extremely inefficient use of land in such a prime town centre site close to major transport nodes. By 2018 it will be five minutes walk to Southeastern trains, DLR, Crossrail and river services. With the huge housing shortages and population growth these sites need far greater density. The exception to the generally poor state of buildings on the site can be seen along Woolwich New Road. Excluding the newer building on the corner with Plumstead Road, these are all of some worth. Most are also reasonably tall. I was worried when seeing the render, shown at the top of the page, that these were for the chop. Reading through however and and the document recognises their value. Of course, as we’ve seen with Building 11 nearby at Woolwich Arsenal, that doesn’t mean proposals won’t come along to demolish in time, and many of the illustrative visuals do not include them. 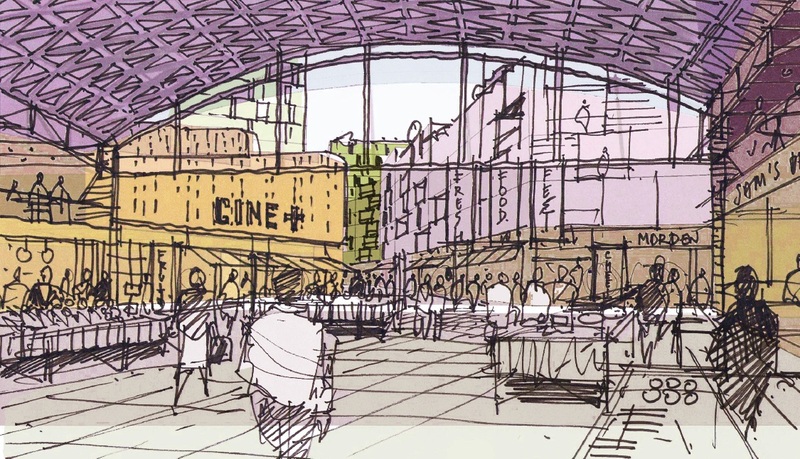 The plans under consultation envisage a new indoor market site with the entrance possibly moving to face Woolwich New Road and the existing outdoor market. The current roof may be retained. Passing through this re-positioned market would lead to a central street running through the site, as the image to the left shows. This central street would have significant retail offerings with residential above. This is exactly what Woolwich needs. To accommodate this some buildings would need to be demolished on Woolwich New Road. As noted, the corner building is a pretty dull recent affair, and it intrudes into the street line so no great loss there. How much will be retained? This parade is in a pretty messy state right now. Hardly any shop fronts are attractive. 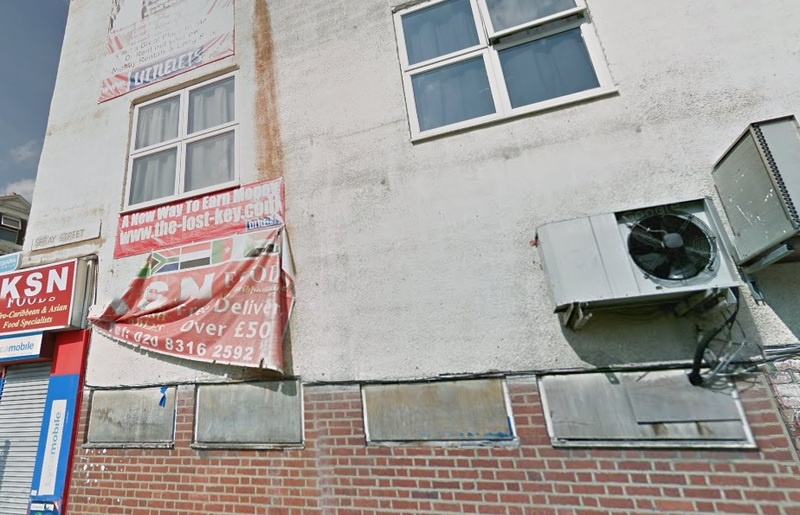 It’s a visual mess of ugly and cheap plastic signs, rubbish awnings, peeling paint, and low quality windows. 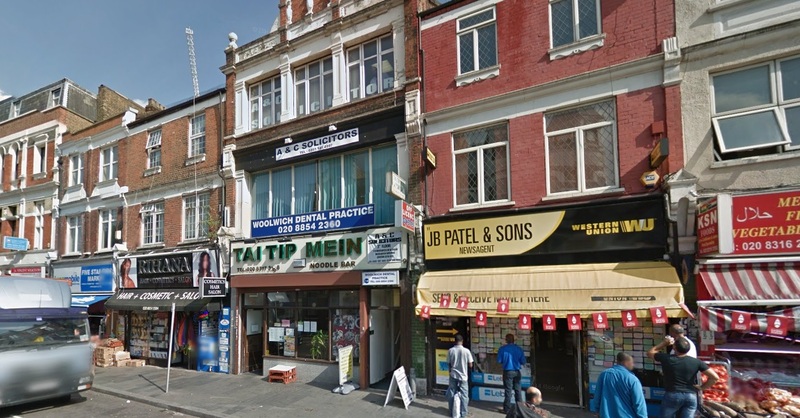 The owners of these buildings and shops generally don’t seem to give a damn. With such a varied and potentially attractive row why has Greenwich council not enforced rules to prevent this mess and have exteriors befitting the buildings? This is not difficult to do under heritage zone rules. The rest of the ‘Spray Street Quarter’ site is generally a mess as well and will be no great loss. It is generally a mix of underused industrial sites and empty space. Tall buildings are shown at the north east corner of the masterplan. Considering the tall buildings opposite as part of Berkeley and Crossrail development, and the wide road between, this level of height and density is appropriate. In front of Berkeley’s towers, there is wide paving and a row of retail lining the street, now well under construction with occupation beginning in 2015. One reason to demolish Building 11, behind this row, is the assumption that a very large number of people heading east from the station need to pass through where the building sits. However, they could do that anyway with the buildings retention, but many heading east towards Plumstead will travel via the main road and not the route behind. With wide paving, lighting, shops and attractive public realm this route will be popular, and it is another reason given to demolish Building 11 that doesn’t seem to stack up. There is also mention in documents about the width of the road. I don’t really see the big deal – many major commercial streets across Europe, Australia and American cities have wide avenues that are thriving either side, with commercial uses such as shops, theatres, cinemas (mentioned in this consultation) and even markets just off them. Can’t say it ever bothered me nor affected the success of those streets. What can be done is removal of the central reservation which is very wide and such wide space between the roads is more suited to motorways. The space gained can be used for segregated cycle lanes. The crossing to the east of the site, which is currently ugly and forces pedestrians into cages when crossing, can be made far easier and less obstructive. It goes without saying that existing businesses will need support throughout this process. 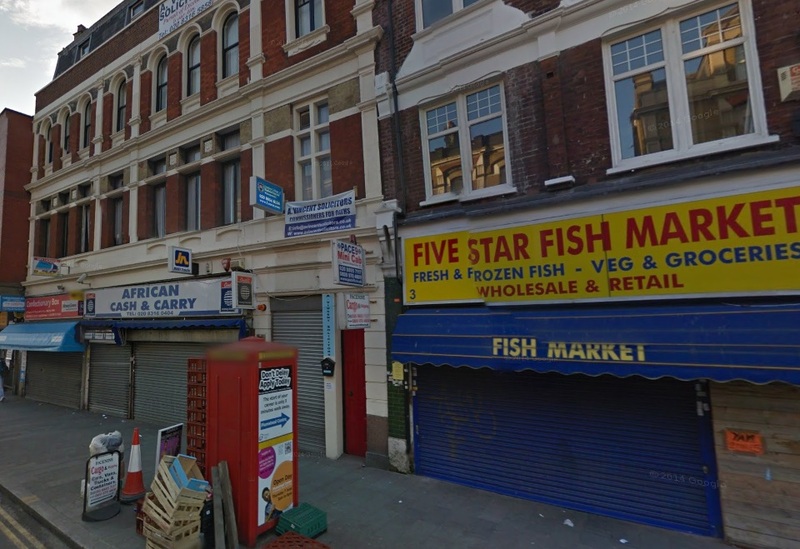 Woolwich has a number of vacant commercial premises that can be used to rehouse the businesses. But overall the plans seem like great news and will provide Woolwich with a big boost. There’s a few people looking to open up along those lines so I’ve heard. Plus you have brewers like Hop Stuff who would perhaps be interested in a stall, and maybe even cafe’s like Cornerstone. Once it settles more from around London and locally will give things a go. I’m a firm believer in the old adage of ‘if you build it they will come’ applying here. So much scope for improvements and a wider choice all over SE London as so much of it is lagging behind other parts of London and pretty much every other UK city. It’s an open goal for people willing to give things a go. Another fascinating reveal on development in woolwich. The potential is really quite exciting. The thing about woolwich that I’ve never really been able to get my head around is whilst it has a sizeable population, circa 60k according to the 2001 census that I read online, probably considerably more now, a small city perhaps, is that there is so little about it online. Its extraordinary. Aside from the odd repeated crossrail piece here and there it is just a sea of nothingness except this beacon of information. Keep up the great work. My understanding is that, although of engineering interest, the roof is not listed. I have responded to the consultation. I support the reorientation of the Covered Market with the existing roof incorporated into the new design. The only other building of note in Plumstead Road (now that the Georgian, former doctor’s house has been demolished after years of forced neglect), is the former Woolwich Infant, which should perhaps be retained. I was concerned that the older buildings around the corner in New Road, despite what it says in the text, do not feature in the pretty picture. With some TLC, the shop fronts could again be in harmony with the rest of their respective buildings – the attractiveness of which is lost in the mish-mash of shoddiness. 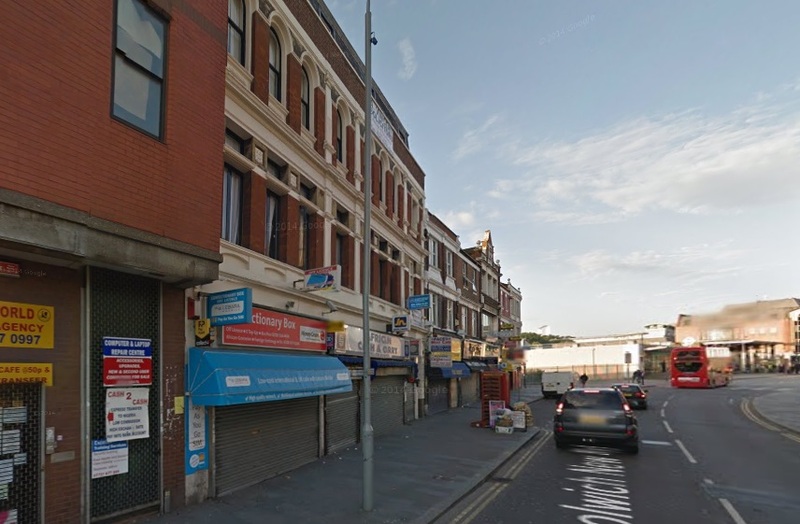 The same goes for Powis Street, where Henry Church’s handsome and unifying architecture goes unnoticed. I have also asked for the retention of the boundary marker in Scott’s Passage and that interesting/attractive features from buildings that are demolished around Woolwich (for instance, the decorative bricks from the side of the General Post Office) be incorporated into new buildings. This would add some interest to them, whilst also retaining some of the town’s history and its personality. Woolwich needs to offer something different to entice people, rather than becoming a bland clone of so many other towns. I agree about the boulevard idea and space for bicycles. 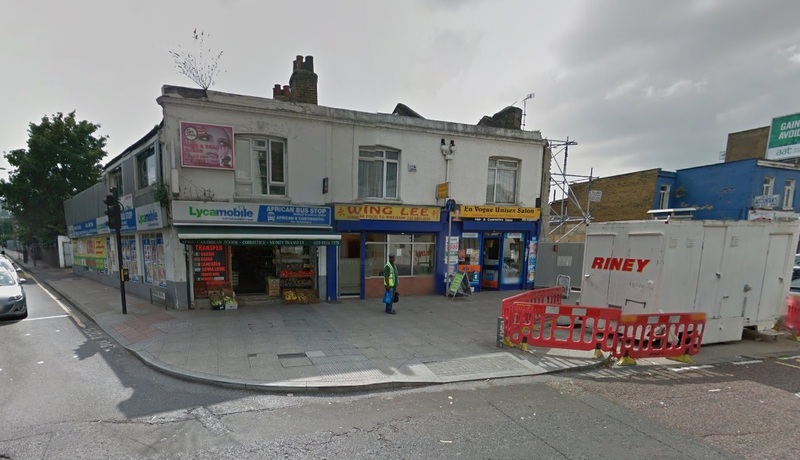 I mentioned that provision for cycling in the quarter cannot be seen in isolation – cycling along Woolwich Rd, Woolwich Church Street and Plumstead Rd is dangerous – not to mention the danger to crossing pedestrians from cyclists! 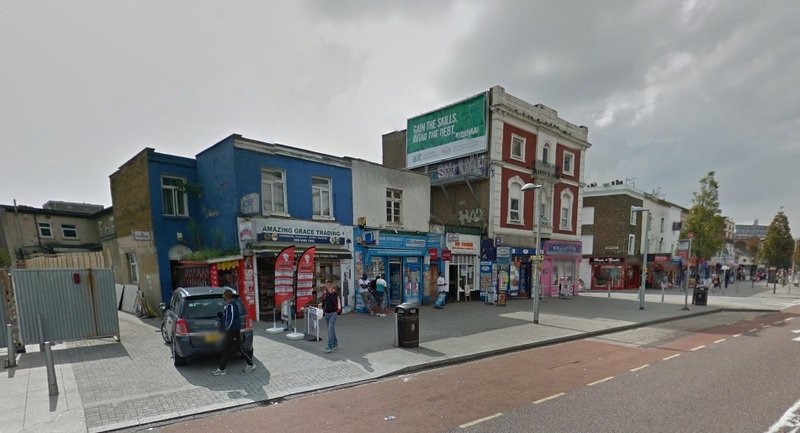 Rejuvinated markets, shops and leisure opportunities will help to attract new residents out of their enclave, but something needs to be incorporated to prompt a psychological link between the two sides of Plumstead Rd. so that the Arsenal becomes properly incorporated into the Woolwich community and existing residents (at least those who can still afford to live in the area) don’t feel like trespassers. Setting the tall building back from the building line, with the height of other buildings increasing in steps seems a good idea. I included some notes on the existance of three purpose-built cinema buildings within the town and the existance of people interested in using the Covered Market during the day and in the evening. It does seem to me that the Council has started to listen a little. A long way to go, though. Not surprised by that at all. That whole parade looked tailor made. People will no doubt speculate it will lead to the larger Sainsbury’s closure but many towns have 2 or more of a singlt supermarket. Tesco do at Woolwich. I would also expect a mini Waitrose or M local around there, which are becoming very common across the country, and have very little presence in SE London. On the subject of Sainsbury’s, when I worked in Woolwich a few years back I heard the school by Macbean Street & Beresford Street was to become a Sainsbury’s. It was a fine old building typical of London Victorian schools. Demolished a couple of years back and nothing has been built there. Flattened by courtesy of redheaddemolition. Another gem lost in the rush for progress. I own one of theses buildings. Why do I now know anything about this? Is it just hear say? Not hearsay – read the link to the councils website in the first line of the post. They’ve been running consultations and signed an agreement with developers after running a competition where they invited tenders. All the renders come from the consultation. These large schemes are often very slow moving though. You could contact local councillors and council departments to find out the impact upon you and what the current status is. The last time Woolwich market square was good was in the early 90’s, the families Dennard (my then husbands family) Edwards, Jackson’s Gould’s Deloue’s Goeff’s , such a varied market with good traditions, sadly i have not been back since 2000….